Review: Gecko Theatre: The Wedding. Nottingham Playhouse. – East Midlands Theatre. Review: Gecko Theatre: The Wedding. Nottingham Playhouse. The most challenging and interesting aspects of a dance-theatre work is that without text marrying the work together to help our understanding of the nature of the work we are left to use our imagination to respond to the sights and sounds being shown. In a sense this is the beauty of Gecko’s startling and often provocative dance-theatre work The Wedding; in that the recognisable is often juxtaposed and even thrown totally out of kilter by abstract dance forms. Regularly the snatches of actual emotionally charged language being used (often Spanish and German) are straight from the tower of Babel and Gecko’s technical sound deliberately confuses the ear by having sounds of invisible individuals shouting from the audience or groups of children playing bounce around the auditorium both in the stalls and circle. Jonathan Everett’s soundscape is disconcerting and shockingly good. The talents of the international Gecko dance ensemble are awe-inspiring. The ninety minutes of constant dance and movement and highly inventive expositions of creative staging mean that not a second of audience attention is lost. Given that this first night packed audience at Nottingham Playhouse is 97% young people from local colleges such as Bilborough this, as a theatre lover, is a delight to see. If the young people are exposed to such exceptionally high quality work as Gecko’s The Wedding and have a chance to explore its creation in situ, back at college or in Gecko’s workshops then this reviewer has high hopes for their creative futures. 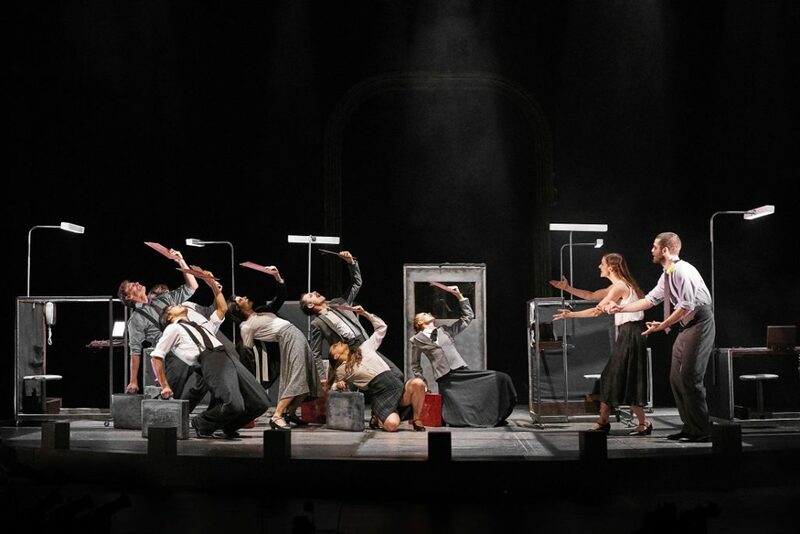 The Wedding has, like many large dance works, been long term developed since 2015 by creator- director Amit Lahav. The mightily impressive end result and über talented cast take the notion of us all being ‘wedded’ to society and bound by the many contracts of modern life. Amit Lahav says ‘For me, The Wedding started as a battle between anger and love. Played out around the complex ideas of belonging, state, exclusion and a longing for community, all set with the excitement and ceremony of marriage.’ Undercurrent, as the dance work progresses and plays with our minds, even through some humour, the notion of the characters on stage wanting to leave the constricts of their ‘married’ lives and gain ‘divorce’ unfolds and rebels. The theatrical results are mind-blowingly good. Gecko, as an international dance-theatre company are strongly about inclusion and community and encouraging individuals to be open and creative. Their emotion fuelled physicality in such shows as The Wedding is highly infective as it is delivered with such total passion by the dancers. So, however one as an individual chooses to interpret the on stage action in any of their shows you are bound to be challenged and come away from the theatre with a whole new perception of the arts of presenting a performance. 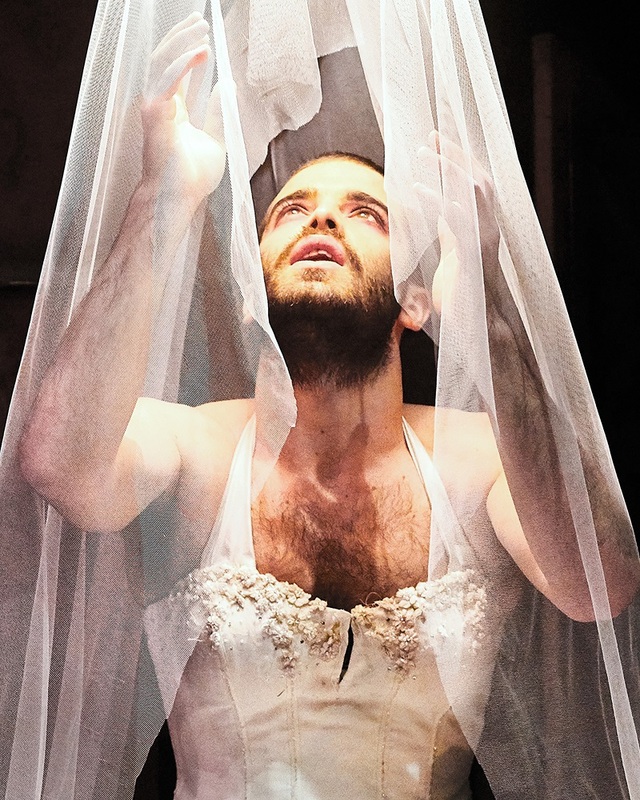 Gecko’s The Wedding runs at Nottingham Playhouse until 3rd February. Tour details. Gecko The Wedding Tour. Originally written for Nottingham Post. Review: Private Lives. London Classic Theatre. (touring) Derby Theatre. Jane Upton ‘Finding Nana’ interview.